Store for archiving purposes, copies of up to 20 digital files of any format, including: Final Draft documents, Call sheets, budgets and bids, Word files, and any multimedia file format. 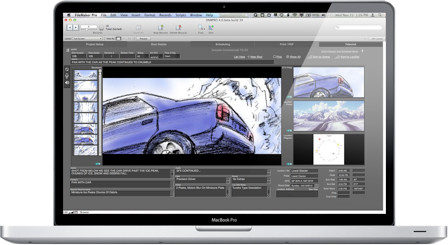 Import Digital Storyboard Images, effects plate images, location photos, blocking or location diagrams with one mouse click. Auto fill in most fields. Type in the first letter and choices of previously entered information appears. Create Adobe PDF files using the new PDF Maker for easy viewing of Directors NoteBook information by others. There’s never been a faster, easier way to find your information than with the new Fast Match feature. Now you can simply select information from the current field, and with one mouse click, find all matching records — even refine your search or broaden it — all without typing! Work on your shot list on the go, import photos directly in your project from your device, using it's built in camera, or from the picture library. Print from your mobile device using "AirPrint" or create PDF's of reports. Directors NoteBook shot list software is an incredible product, allowing filmmakers to be completely creative designing their shots, while the software organizes all the details for them. Directors NoteBook is not just for Directors; Producers, ADs, Cinematographers, VFX Supervisors, Editors, Production Companies, and Post Houses all use Directors NoteBook software. So easy to use. If you can fill out a web form, you can use Directors NoteBook. Directors NoteBook 4.5 SA has all of the great features as the Pro version, but does not have the customization and multi-user collaboration capabilities. Record Voice Memos associated with individual shots. Share Directors NoteBook Pro on a Network, and use it as a multi-user collaboration tool with different access privileges for each user. For example: a director in Beverly Hills can be working on his shot list, while a location scout in Paris is adding location photos to it, the ad agency in New York is viewing changes live, the production office in Hollywood is printing everything out for the Pre-pro booklets, and later, the colorist working on the dailies can view the director's color suggestions. Display and E-mail Teleciné instructions from digital captures of the day's shoot. Import images you've color corrected in an image editing program (e.g. Photoshop). 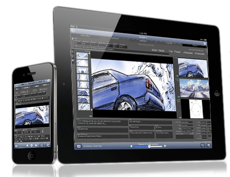 Write instructions for your colorist, and compare with storyboard and efx plate images. Print to PDF and e-mail, or review on-site with your computer. Screen and PDF layouts contain SMPTE Color Bars and Grey Scales as control items. Data Entry Short Cuts let you re-use text already entered in other shots, import images, and add data from pull-down menus and pop-up lists. Review and Present your ideas in an on-screen slideshow at pre-production meetings or via video conferencing. Create Shot Lists with just a click or a tap. 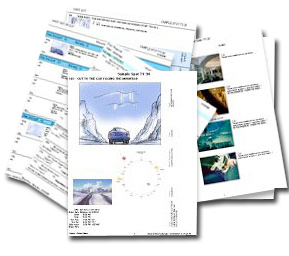 Directors NoteBook generates over 20 different printouts, boards and reports (all customizable in the Pro version): storyboards, shot lists, efx plate lists, shooting schedules, location diagrams, camera notes, etc. Even 3x5 cards. ...And now its a whole lot cheaper! Directors NotePad 4 is an ultra lite stand alone version of the popular professional director's tool Directors NoteBook. Directors NotePad 4 helps amateur film makers organize their ideas shot by shot and view them on screen in slide show form and as printed lists organized in edit order (scene order), and in shot setup order. It's also a wonderful tool to pre-visualize edits before you start. Print out 3X5 cards of your shots and juggle them around to experiment with different story telling techniques, and see if any shots might be missing, or are now unnecessary to capture. Plan vacation movies ahead of time, to make sure no shots are missed. Directors NotePad 4 shows users the importance of preplanning shots for their home movies and slideshows so they get the absolute best results from their digital hub. 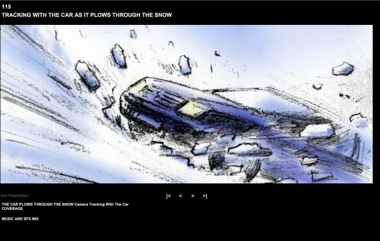 Import Digital Storyboard Images and location photos, with one mouse click. Create Shot Lists with a Click of a Mouse. At a click of the mouse it can generate any of 5 different printouts and reports: 3 different shot lists, the script, and 3X5 cards (very useful for organizing ideas and pre-visualizing edit orders when away from the computer). Be completely creative designing shots, Directors NoteBook organizes all the details for you. Easy to use, virtually no learning curve. For Directors and Producers, ADs, Cinematographers, VFX Supervisors, Production Designers, Art Directors, Assistants, Editors, Production Companies, and Post Houses all use Directors NoteBook software. Import Digital Storyboard Images, effects plate images, location photos, blocking or location diagrams with one mouse click, or use your iOS device's camera.